Double Head Auger Powder Filling Machine Is Used To Fill Variety Of Products Like Granules, Powder Etc In Bottle At Comparatively Higher Capacity Like 60 Bottle Per Minute. 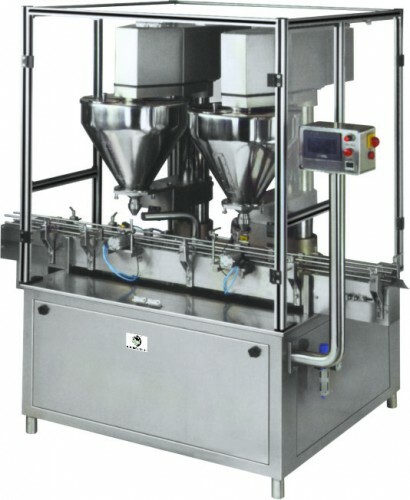 In Order To Get Precise Filling, Model Is Available In Servo Driven Auger Configuration Also. Weight variation not more than +/- 1.0 % depending on powder nature, fill weight & speed. Works on Auger metric principle. Electronic controls – simple and reliable electronic controls ensure precise control of dosages. No dripping – dripping after the filling stroke eliminated by using precisely machined parts, and improved auger design. Lower cost of production – since requirement of labor, space and support facilities is minimal. Simple operation- easy to operate & maintain. Two hoppers for two head. In built powder hopper of 17 L capacity. Conveyor of Double Head Auger Powder Filling Machine feeds bottles from left to right. Empty bottles are indexed by Star wheel then they are enter in to the the respective filling head. After filling, the filled bottles are conveyed on the exit conveyor for next operation and cycle continues. Output and accuracy of the machine is subjected to flow property of the powder and other related conditions. 5 gms =70 BPM and 20 GMs =60 BPM speed can be considered.